We offer comprehensive transfer services to and from Halong Bay, with car sizes ranging from small sedan to group coach. Our prices are competitive, our cars are in excellent conditions, our drivers are experienced, and our services are simply unbeatable. You can find below a list of sample price on selected routes. If you require a customized itinerary, please contact us for further details. You can email us: info@halongbaytours.com or call us: (+84) 946-505-505 to book your transfer. Our customer supports will respond promptly for your request. To guarantee maximum trip comfort, we suggest you book the private transfer service at least 24 hours prior to your departure. 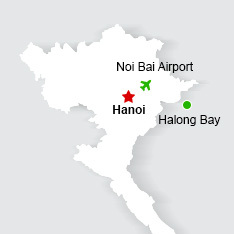 Halong Bay is about 170km away from Hanoi, about 3.5-4 hours by car. We accept 24 hour in advance reservation. All rates are quoted in US dollars per car per route, including fuel cost, driver, overnight fee and accommodation for driver (in case of 2-3 day transfer). Pick up and drop off point upon request. From Hanoi to Halong, there will be breaks for photo shooting or quick snack upon request. Special discounts apply when you book cruise with us. Khanh receives constant praises from travelers who traveled with him. Honest and friendly, Khanh turns his 9 year driving experience into a safe, fun and enjoyable trip for every of his guests. He loves driving and meeting new people and the job is more of a reward than a means of living for him.